It is not uncommon for biblical creationists to be subjected to demands for proof of our claims. I will allow that it is reasonable when asked by an honest enquirer in a civil manner, but when an atheist will phrase it, "Prove that your fictitious Flood happened and that your nonexistent God did it", or similar, we are not exactly interested in falling over ourselves to oblige. Worse, absurd remarks that the Genesis Flood is a fairly tale are often made in regards to an article that the mocker didn't bother to read. I reckon that they ridicule, seek rescuing devices, and outright ignore the evidence because reality threatens their materialistic uniformitarian worldview. Over at Real Science Radio, the hosts presented evidence for the intellectually honest. They had a broadcast, which became two, which became three because they were having fun. Secularists will frantically search for excuses and cohorts to join in with the scoffing, but they will not be able to change the facts. Most of the list is about physical evidence for the Flood, and in the third broadcast, they discuss reasons why a local flood is impossible according to a consistent reading of the Bible. Two remarks that I want to make. 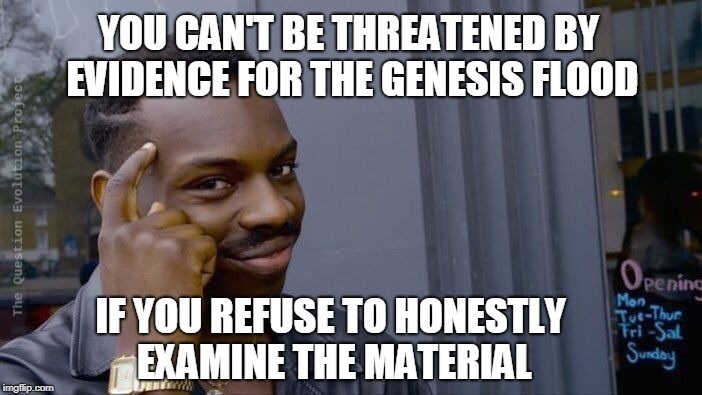 First, I am not a fan of Bob Enyart's "open theism", so I recommend caution when dealing with his theology sections. Second, Bob and his co-host Fred Williams are great fans of the hydroplate theory of the Flood presented by Dr. Walt Brown, and make several references to it. Enyart misrepresented the dominant plate tectonics model and showed misunderstanding of it. Two articles discussing flaws in Brown's work are "Analysis of Walt Brown’s Flood model" and "Can One Astronomically Date the Flood within the Hydroplate Model?" While no historical science model is perfect and need refinement as new information is collected, it is good that people are thinking and examining each other's work. As I've said, creationist scientists are not in lockstep, just as their secular counterparts also have disagreements on various models and ideas. The first link is the best as far as having a list of evidence and several links. I still need to post links to all three broadcasts so's y'all don't have to hunt. As usual, they are free to download or listen online.